For over a year, now, a follow-up to Get Hooked has been in the works. Fifteen brand new patterns and awesome tutorials will rock your world! The book will come out in early October; look for a free pattern, coming soon! Illustrations are by Cynthia Frenette. Photos are by Pamela Bethel and Angela Fama. Run, don’t walk! Elann.com is offering Get Hooked at a can’t-beat-it $6.95US. My brother just pointed this out to me. I’m so psyched! Thanks to everyone who’s ordered a copy so far. I hope you love it! 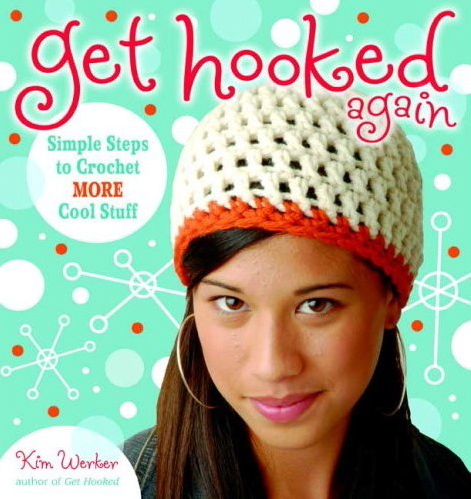 Get Hooked is now shipping from Powells.com, our preferred online independent bookstore, and also from amazon.com! I can only imagine that means it’s on book shelves across the land (has anybody seen it?). Woo hoo! And had I mentioned our Monsters of Teen Craft book tour is on Myspace now? Get Hooked is available for preordering at Amazon and Chapters, but it looks like Elann.com is shipping now. Woo hoo!